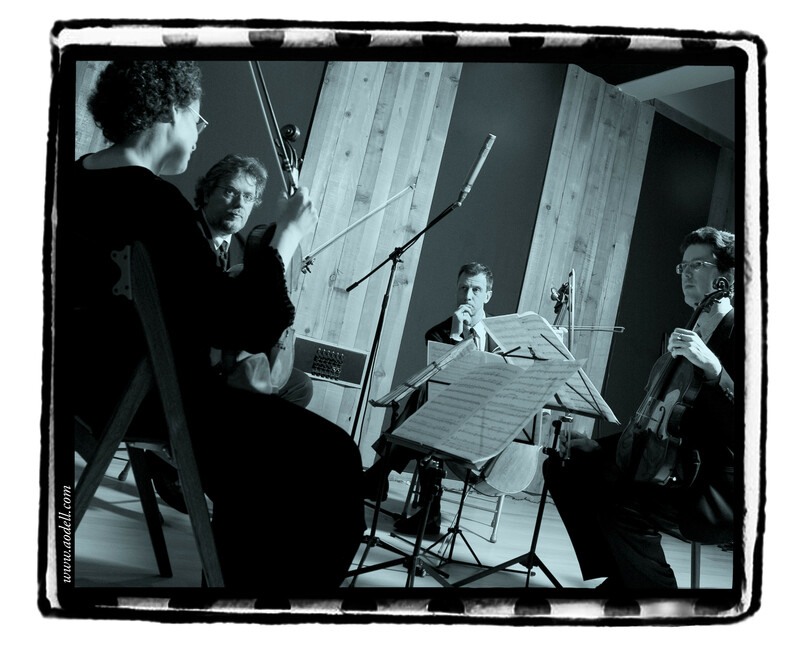 One of the noteworthy recordings released in 2016 is the Kepler Quartet’s third volume of string quartets by Ben Johnston (New World Records). Johnston, who turned ninety this year, is well known for his work in unconventional tuning systems, namely extended just intonation. The complexity of some of his works in this system, notably the Seventh Quartet, included on Kepler’s volume 3, ranks up there with some of the toughest chamber works in the literature. Even a seemingly more straightforward piece, such as his Fourth Quartet, a trope on “Amazing Grace,” can provide both formidable pitch and rhythmic challenges. Recently, I was in touch with the violinists of the Kepler to discuss Johnston’s work and the new recording. When did you first become familiar with Ben Johnston’s work? I was aware of the original Fine Arts Quartet’s 1964 recording of Ben’s 4th Quartet (Amazing Grace) as a student in the late 70″s, from studying briefly with Leonard Sorkin–the FAQ 1st violinist who commissioned the piece. I subsequently played it several times for the Present Music concert series in Milwaukee, as well as Calamity Jane and her Daughter, Ben’s transcription of Harry Partch’s Barstow, and a few other works. When you decided to go about recording the quartets, did you have any idea how long it would take to realize the project? No idea whatsoever. But we made the commitment to Ben, to New World Records, and to ourselves to complete it–damn the torpedoes! An article in the N.Y. Times (and other writers) have called Johnston’s Seventh String Quartet “the most complex ever written.” Do you agree? Why do you think it is so hard? The crazy crawling harmonies, that’s obviously extremely complex. The challenge that is not-so-obvious is that he is dealing with the way time passes, movement by movement; time passing so quickly that it leaves you in the dust, time elapsing at a normal pace– but with a surreal 3D layering of palindromes offset by various cell lengths, or time dragging so slowly that it’s hard to fully comprehend the rigorous structure which exists. To me, that is the underlying brilliance of the piece. How does the Seventh Quartet compare to the others in terms of difficulty? In the sense of the sheer number of pitches involved, yes, #7 is the most difficult. But that is only one type of challenge posed by Ben. In Quartet #6 (also on this 3rd CD) for instance, every chord overlaps with the one both before and after it. Given the nature of the chords to begin with, that’s extremely challenging in it’s own right.. And I could cite multifarious examples of uncharted waters, throughout his 10 quartets. I was recently speaking to a friend who heard your recording of the Fourth Quartet, loved it, and decided to work on it with a student quartet. He said that he was surprised that something that, audibly and on the surface, seemed so accessible to players was actually quite hard. Do you find that too – that “appearances can be deceiving” in terms of the complexity of these pieces. Yes and no… he uses a genius-level grasp of musical craft to achieve a music that everyone can relate to in a spiritual/emotional way, if they give it that chance. It’s a music that resonates because, once again, it’s founded upon the natural order of acoustics. Now that you’ve climbed this Parnassian mountain, what’s next for the Kepler Quartet? Which composers are you interested in performing and recording? Even though we all play a lot of contemporary music, it might be useful to draw some connections to where this music came from. It’s easy to think of Ben as a maverick composer, a unique innovator, a specialist. He is, but also much more than that. He’s really a great composer in the traditional sense, and his music will only become truly appreciated in that larger context. How did you go about learning the quartets? We dealt with them one at a time. There is a certain amount of work that needs to happen before the playing begins. Each pitch must be defined according to its role in the harmony within the just intonation system. Ben’s notation provides a tool for establishing the relationships in every chord, no matter where he has taken the progression. Adding and subtracting his accidentals places a pitch. The ultimate judge is your ear, because every note is determined by its function. Once you understand your role within a given chord, you will hear how to place your notes. Of course, as with any piece, we study the score, to understand its structure and the emotional intention behind the music. Rehearsing is a slow painstaking process of tuning and balancing each chord while gaining an intellectual grasp of the harmonic journey. As the sonic world comes into focus, it informs our choices about the timbre and shape of individual phrases. We worked through every single note of every single chord with the composer, uncovering copy errors, and getting his input on musical decisions. Why do you think that the Seventh Quartet is so hard? The 7th quartet is especially daunting because it has a hugely expanded pitch group. Ben travels so far along the spiral of pure harmonic progressions that there are over 1,200 discrete pitches in the octave. Actually, in some ways I didn’t find the 7th quartet the most difficult. For example, the 6th quartet is more musically obscure and difficult to grasp. The 7th quartet makes sense, but you have to be able to work (and hear!) the system. How would you go about teaching these pieces to the next generation of string quartet players? Moreover, for those who want to learn Johnston’s tuning system, where would you suggest they turn? I already teach Ben’s music at The Boston Conservatory. Every once in a while an adventurous quartet wants to make the attempt. Invariably, for the students it is a transformative experience. As one cellist said, “nothing will ever be the same.” Learning these works is a matter of learning how to hear—to be wholly immersed in vertical relationships, attuned to the harmonic series, and completely committed to the present moment. At the same time, one must listen forward and backward—anticipating root movement of chords to hear where pitches will belong ahead of time, or relating back to what has just happened. It is incredible ear training, and requires rethinking what pitch is, how it works, and how it can be manipulated. When teaching these works, I like to start with #9. The first movement is a clearly defined C Major just tuned scale (with a cameo appearance by that interesting anomaly, the syntonic comma). Young players find it rhythmically challenging—the rhythmic complexities are based on the same ratios that define the intervals of the just tuned scale. The third movement is a simple hymn-like melody, with clear almost traditional harmonies. What makes it so fantastic and emotionally potent is the harmonic slide down two syntonic commas (from F Major to F- Major to F – – Major) and back up within the first phrase. This modulation is part of opening the tempered ‘circle of fifths’ to its naturally occurring spiral. Hearing it has a strong, visceral effect. I have written an article (“An Introduction to the String Quartets of Ben Johnston,” American String Teacher, Volume 64, Number 3, 8/2014) that details how to approach these scores—how to tune the instruments’ open strings, how to do the math required by Ben’s accidentals). I think the article will also be made available on Kepler’s website, and that is definitely a good place to start. Without those preparatory steps, the score can’t be realized as the composer intended. Next, the players must tune and balance each chord, working back and forth between harmonies to understand progressions and internalize relationships. All this ultimately supports the interpretation of the music, making a much more powerful, visceral statement. Tomorrow, famed microtonal/just intonation composer Ben Johnston turns ninety. To celebrate his 90th birth year, the Kepler Quartet releases the third and final volume of their series of Johnston’s string quartets in April on New World.